Jordan’s foreign policy is that of the perpetual strategist. It is acutely aware of its own limitations, and it manages those limitations through preserving careful diplomatic relations as far as it possibly can. The Hashemite Kingdom is a case in point that diplomacy can not only maintain a nation’s security, but even allow it to wield a disproportionately large degree of influence to its size and GDP. However, the Syrian conflict has put Jordan’s diplomatic skills to a grueling test, and it remains to be seen whether that strategy will work forever. This is particularly questionable now that the west has shown it is willing to strike Assad when it comes to chemical weapons. As a reliable western ally, but one that must also remain on good terms with Damascus if it is to survive itself, Jordan’s ability to independently hedge its allegiances is going to be stretched further than ever. Amman’s diplomatic power is jealously guarded. Testament to that is the fact that Jordan criminalised “acts damaging to the Kingdom’s relations with foreign countries” in counter-terrorism legislation. Indeed, in 2014, the Syrian Ambassador to Jordan, Bahjat Suleiman, fell afoul of these regulations and was expelled from the country after he criticized Jordan and the Gulf states on social media, accusing them of backing Syrian rebels. Syria reciprocated in kind and expelled the Jordanian ambassador. But in late 2017, there was an uptick of communication between Amman and Damascus, and commentators began to anticipate the normalisation of Syrian-Jordanian relations once again. As a result of its vulnerable northern border, Jordan has invested a great deal of diplomatic effort creating de-escalation zones in southern Syria. Amman was key to getting America and Russia to work together, and the three countries created a tripartite de-escalation zone in Deraa and Quneitra provinces on the Jordanian border. The spirit of the agreement has held and been expanded upon, with a Memorandum of Principles to protect the ceasefire signed by the U.S., Russia and Jordan in November 2017. However, there are still concerns about the activity of Shia militias in the area, concerns shared by neighboring military power Israel. Thus whatever Amman’s reservations about Assad, and despite his alliance with Iran (the backer of many of these militias), it would still rather Assad’s forces control the precarious border region than Hezbollah, ISIS affiliates, or other jihadist groups in the area. If, as is looking likely, Assad remains in power, Jordan will do its best to smooth things over for the sake of stability. But the volley of airstrikes from the US, the UK and France on April 14th may complicate Amman’s tactical amelioration. In the aftermath of the strikes, Jordan sought to distance itself from their conduct, and to emphasise its relative neutrality. His Majesty King Abdullah was reportedly on the phone to British Prime Minister Theresa May on the day of the strikes, and he insisted that a political solution must be reached. Mohammed Momani, Jordan’s government spokesman and Minister of State for Media Affairs, reiterated calls for a political settlement in a statement, and added that maintaining the territorial unity of Syria was necessary. But despite Jordan’s official position on Syria being charted independently of the west, the Kingdom is practically intertwined with the Euro-American efforts against Assad, in ways which may complicate its future relations with Syria, and with Russia. It hosts the US’s Military Operations Centre in Amman, a facility whose activity has been winding down since the collapse of the Southern Front Syrian rebels that they supported, but that still serves its purposes. 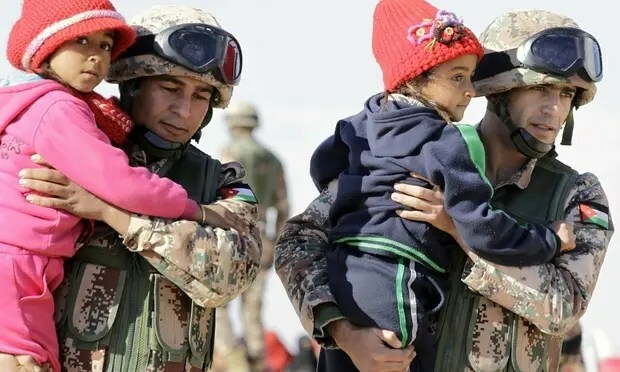 Awkwardly for Jordan, an enormous joint American-Jordanian military training exercise called Eager Lion was set to start a few days after the strikes. This exercise saw 3,600 US troops arriving in Jordan. The optics around Eager Lion forced US and Jordanian leaders to deny that they were preparing an invasion of Syria when the exercise was held for the first time last year. Both American and French militaries have squadrons of fighter jets stationed in Jordan as well. Still, Amman has tactically cultivated working relations with Russia, and so far it seems to be paying off. Jordan is well-aware that Moscow will be a significant broker of any future political settlement, and that it cannot afford to alienate them. For now, it is unlikely that either Moscow or Damascus will force Amman to choose a side, and the same is true of America and invested European states. Jordan’s role as a relatively neutral arbitrator remains useful to both sides for now. For its own stability, Jordanians can only hope that remains the case. Hopefully King Jordan love his neighbor as you love your country. Peace will be achieved 100 percent as well Turkey.